The Home Owners' Loan Corporation (HOLC) was a government-sponsored corporation created as part of the New Deal. 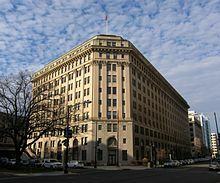 The corporation was established in 1933 by the Home Owners' Loan Corporation Act under the leadership of President Franklin D. Roosevelt. Its purpose was to refinance home mortgages currently in default to prevent foreclosure. The HOLC issued bonds and then used the bonds to purchase mortgage loans from lenders. The loans purchased were for homeowners who were having problems making the payments on their mortgage loans "through no fault of their own". The HOLC then refinanced the loans for the borrowers. Many of the lenders gained from selling the loans because the HOLC bought the loans by offering a value of bonds equal to the amount of principal owed by the borrower plus unpaid interest on the loan plus taxes that the lender paid on the property. This value of the loan was then the amount of the loan that was refinanced for the borrower. The borrower gained because he or she was offered a loan with a longer time frame at a lower interest rate. It was rare to reduce the amount of principal owed. The typical HOLC loan before 1939 was an amortized 15-year loan, compared with the 3–6 year mortgages offered by commercial banks and the 10–12 year loans offered by Building and Loans in the 1920s. The interest rate on the original HOLC loans was 5 percent at a time when most mortgage loans were being offered at an interest rate of 6 to 8 percent. In 1939 the corporation lowered the interest rate to 4 1/2 percent for a large group of borrowers. The HOLC loans were typically amortizing, so that there were equal payments each month on the loan. This contrasts with interest-only loans in the 1920s in which the borrower would make payments equal to the interest on the loan each month until the end of the loan and then repay the principal (the amount borrowed) at the end of the loan. Until the early 1930s borrowers often paid the principal owed by taking out a new loan. When the economy fell apart in the 1930s it became very difficult to borrow and many borrowers could not repay the principal owed at the end of the loan. It also contrasts with loans at Building and Loans (B&L) in the 1920s, which often lasted 10 to 12 years. The B&L loans were direct reduction loans in which some payment of the principal owed was made each month; therefore, the length of the loan would not change unless the borrower failed to make payments. The direct reduction loan has become the most common type of American mortgage. Between 1933 and 1935 the HOLC made slightly more than one million loans. At that point it stopped making new loans and then focused on the repayments of the loans. The typical borrower whose loan was refinanced by the HOLC was more than 2 years behind on payments of the loan and more than 2 years behind on making tax payments on the property. The HOLC eventually foreclosed on 20 percent of the loans that it refinanced. It tended to wait until the borrower had failed to make payments on the loan for more than a year before it foreclosed on the loan. When the HOLC foreclosed, it typically refurbished the home. In many cases it rented out the home until it could be resold. The HOLC tried to avoid selling too many homes quickly to avoid having negative effects on housing prices. Ultimately, more than 800,000 people repaid their HOLC loans, and many repaid them early enough. HOLC officially ceased operations in 1951, when its last assets were sold to private lenders. HOLC was only applicable to nonfarm homes, worth less than $20,000. HOLC also assisted mortgage lenders by refinancing problematic loans and increasing the institutions liquidity. When its last assets were sold in 1951, HOLC turned a small profit. HOLC is often cited as the originator of mortgage redlining. HOLC maps generated during the 1930s to assess credit-worthiness were color-coded by race, with majority African-American areas marked in red and designated as "hazardous." The racist attitudes and language found in HOLC appraisal sheets and Residential Security Maps created by the HOLC gave federal support to racist real-estate practices that helped segregate America throughout the 20th century. The effects of redlining, as described by HOLC maps, endures to the present time. A study released in 2018 found that 74 percent of neighborhoods that HOLC graded as high-risk or "hazardous" are low-to-modern income neighborhoods today, while 64 percent of the neighborhoods graded "hazardous" are minority neighborhoods today. “It’s as if some of these places have been trapped in the past, locking neighborhoods into concentrated poverty,” said Jason Richardson, director of research at the NCRC, a consumer advocacy group. Another study, published in 2017, found that areas deemed high-risk by HOLC maps saw an increase in racial segregation over the next 30–35 years, as well as a long-run decline in home ownership, house values, and credit scores. HOLC was established as an emergency agency under Federal Home Loan Bank Board (FHLBB) supervision by the Home Owners' Loan Act of 1933, June 13, 1933. It was transferred with FHLBB and its components to the Federal Loan Agency by Reorganization Plan No. I of 1939, effective July 1, 1939. It was assigned with other components of abolished FHLBB to the Federal Home Loan Bank Administration (FHLBA), National Housing Agency, by EO 9070, February 24, 1942. Its board of directors was abolished by Reorganization Plan No. 3 of 1947, effective July 27, 1947, and HOLC was assigned, for purposes of liquidation, to the Home Loan Bank Board within the Housing and Home Finance Agency. It was terminated by order of Home Loan Bank Board Secretary, effective February 3, 1954, pursuant to an act of June 30, 1953 (67 Stat. 121). ^ "Renovation of the Home Owners Loan Corporation (HOLC) Building". John C. Grimberg Company. Archived from the original on January 24, 2013. Retrieved December 23, 2010. ^ Harriss, C. Lowell (1951). History and Policies of the Home Owners' Loan Corporation (1st ed.). New York: National Bureau of Economic Research. p. 1. ^ Fishback, Price; Rose, Jonathan; Snowden, Kenneth (October 2013). Well Worth Saving: How the New Deal Safeguarded Home Ownership (1st ed.). Chicago: University of Chicago Press. ISBN 022608244X. ^ Nelson, Robert K. "Mapping Inequality". Mapping Inequality. University of Richmond. ^ Mitchell, Bruce. "HOLC "redlining" maps: The persistent structure of segregation and economic inequality". National Community Reinvestment Coalition. ^ Jan, Tracy. "Redlining was banned 50 years ago. It's still hurting minorities today". Washington Post. ^ Aaronson, Daniel. "The Effects of the 1930s Holc "Redlining" Maps". FRB of Chicago Working Paper No. WP-2017-12. ^ "Records of the Federal Home Loan Bank Board [FHLBB]". National Archives. 2016-08-15. Retrieved 2017-10-24. * Brennana, John F. "The Impact of Depression-era Homeowners' Loan Corporation Lending in Greater Cleveland, Ohio," Urban Geography, (2015) 36#1 pp: 1-28. Price Fishback, Jonathan Rose, and Kenneth Snowden, Well Worth Saving: How the New Deal Safeguarded Home Ownership. Chicago: University of Chicago Press, 2013. This page was last edited on 19 March 2019, at 16:29 (UTC).